From Sepoy to Subedar is the autobiography of Sita Ram, a soldier in the Bengal Native Army who rose from the humble rank of sepoy to the officer rank of subedar. Or it is a con, a fiction, a sophisticated hoax that has stood almost unchallenged for 140 years. But the latter is the minority view. Most commentators believe it to be genuine. From Sepoy to Subedar came to my attention through online references, with a smattering of reviews talking of its historical interest. Though it is available on Amazon I imagine it sells very few copies these days, but for a while it was a standard text for British officers training in India. Its status might seem of purely historical interest now, yet it is a curious text and I came to see it as casting some light on the Empire many British people still struggle to understand. For a long time the book seems to have been considered a minor work and presumably sold few copies. Then in 1911 under one Colonel Phillott, the colonial government created a new syllabus for the Hindustani exams offered to officers as part of their education. From Sepoy to Subedar was selected as a key Urdu text, translated from English by Phillott himself. The book was never, it should be said, published in its original form. Why not? The ‘original’ Hindi manuscript was never produced by Norgate. No-one has ever seen it. One sceptic at the time was told that a senior Indian civil servant had read the original. But no-one ever met Sita Ram, or found any trace of him. This means that every piece of evidence for the authenticity of the text comes from within the Raj’s own hierarchy. Nonetheless from 1911 onward From Sepoy to Subedar became a key text in the Hindustani syllabus for British officers. It was still in use as an educational tool in the 1940s, when it was translated into Devanagari. In the 1970s a new edition by James D. Lunt brought it to a wider English-speaking public. So what does From Sepoy to Subedar tell us? It tells us that this sepoy at least had enormous respect for the British Empire. Sita Ram loved his officers when they treated him well, though he disliked those who acted too high-handedly or who took no interest in their men. He was loyal and brave, denouncing those who rose up against their masters in the ‘Mutiny’ as stooges of the Nawab of Oudh and the King of Delhi. He sacrificed much for the Sirkar (the Raj) but ultimately felt much gratitude to it for the opportunities it had given him. He comments little on the general worth of military adventures, though does dare to frown on some of the worst military failures and offers advice on how they could have been avoided. From Sepoy to Subedar says, in other words, exactly the type of things you would tell a British officer in India if you wanted him to feel he had a right to be there but should be careful in his treatment and deployment of native soldiers. Equally concerning are Sita Ram’s magical abilities to be on nearly every major battlefield across the Indian subcontinent during his service. In the case of the Indian Rebellion, Sita Ram even had the foresight to warn his officers of dissent in the ranks, then was captured by ‘mutinous’ countrymen and had to escape. He caught up with the fighting later, during which his side committed no atrocities, or none that he mentions. There was one tricky situation to deal with: the First Anglo-Afghan War. Since only one member of the expedition returned alive, how could Sita Ram both be there and live to tell the tale? The problem is resolved by his being kidnapped by Afghans and held as a slave, then rescued by the punitive second expedition. Likely? Some sepoys may have been captured as slaves, but like a few other lucky escapes in Sita Ram’s tale, it is the convenience of it all happening to the writer of the narrative that doesn’t ring true. I began to research how many others had shared my doubts over the existence of Sita Ram. There is certainly a history of scepticism. It is generously mentioned in the introduction by James D. Lunt (another military man) to his own 1970 edit of the manuscript, then dismissed. In 1971 the Canadian journal of Pacific Affairs[viii] reviewed Lunt’s edition and expressed serious doubts about its authenticity. But that’s the kind of unreliability one can expect of North Americans. Within the British establishment, while discussion of its authenticity is permitted in academic circles, the book is still accepted at face value, with William Dalrymple being the latest expert to declare it believable. I could find only one recent English-language essay that really tackles the question marks head-on. Alison Safadi[ix] expresses her bafflement at the credulity shown towards the text, getting in her bemused sideswipes in the course of her study of colonial linguistics. She mirrors my own doubts in her discussion of the coincidences and adventures in the life of Sita Ram, and in noting the strange alignment of ideas of Sita Ram and British officers. Safadi also points out many weaknesses in the arguments put forward in favour of its authenticity, most notably calling on her expertise to say that the Hindustani phrases thrown into the text – and offered as proof of authenticity –are precisely the types of common phrases and sayings that most British soldiers in the Raj would have known. The transliterations of these words also suggest, says Safadi, a British hand. So let’s state the suspicion clearly: that the entire book was written by Lieutenant-Colonel Norgate. The paternal attitudes shown by officers towards sepoys in the book were certainly consistent with an officer’s self-image[x]. It was written by someone with a reasonable amount of knowledge about India, as might be expected of a British officer but, says Safadi, with some gaps in that knowledge that wouldn’t be expected of an Indian author. While army historians of the colonial period appear to have mentioned Norgate, it is difficult to find primary sources about how he spent his time. While his military record is publicly available, I could unearth little about his own writing skills, or whether he engaged in public relations work for the colonial military. The claim is that he translated the book with the help of an Indian translator[xii], so even if we were to discover that his language skills were poor, the official story has that covered. If our suspicions are correct then we need to ask a few questions: why did From Sepoy to Subedar appear when it did? What led to its prominence in the following century? And what does it mean, when so many question marks have always hovered over it, that it has been accepted by so many for so long as a genuine text? Says Sita Ram. Or Norgate. It should be noted that the sepoy infantry Norgate commanded ‘mutinied’ in 1858. Can the book be read as an exorcision of personal demons? The book’s later adoption by the military educational establishment is even more suggestive if we begin to think of it as a form of auto-propaganda among the officer class. What it seems to imply is that certain officers could not feel sure that new officers in the field would understand the full benevolence of the British Empire in India and so should have it explained to them from the mouth of a Real Indian. This raises the obvious question: if the Raj was so clearly a benevolent force in India, what need to explain that to anyone? Surely it would have been obvious in the gratitude of the natives one met everywhere. But as we have seen, the actual gratitude of the native could not be counted upon. Does any of this still matter? Is it just a minor chapter in the history of hoax texts? Who even reads the book now? Well it does get read a little, by historians such as Dalrymple, and perhaps by others too: at least two entries on Wikipedia cite the book as a historical source. It has been quoted too in recent more scholarly works such as Tan Tai Yong’s Garrison State[xv]. It is the nature of the internet in particular that citations can multiply from few online sources. Information gets replicated, the veracity of the initial source never gets questioned, the in-depth research never materialises. In the online world, several reputable publications citing someone can feel like serious evidential back-up in comparison to the mass of citation-free information floating around. At what point does the citation get challenged? Who will do that work, without pay and with little prestige attached to the debunking of so minor a work? It was these questions that impelled me to write this article. I love the flow of knowledge on the internet, yet collective responsibility for that knowledge can only be attained by individuals taking responsibility for developing it. There is another reason, perhaps just as important, to challenge use of the book as a historical source. if the suspicions about its authenticity are correct then From Sepoy to Subedar does tell us something about British rule in India: it suggests that some in the officer class felt they had to resort to dishonesty to keep even their own officers on board with the colonial project, let alone their Indian subjects and soldiers. That conclusion wouldn’t surprise a George Orwell perhaps, who quickly saw through the façade of benevolence when he was posted to Burma as an imperial policeman, but then it largely isn’t Orwell’s anti-colonial writings that are set literature texts in British schools. To the extent that it mentions the topic at all, the British establishment still attempts to obscure the nature of the Empire: that it was run for the commercial benefit of powerful British people, not for the benefit of ‘the natives’. The secret From Sepoy to Subedar wishes to hide then, is that Indian people were capable of holding their own views of the Empire that might not have accorded with the views of the British officer. One objection to my thesis remains: perhaps many natives were grateful. Who am I to deny Sita Ram the right to gratitude for the material advantages he gained from the British army? Perhaps I am doing some silencing of my own. I certainly have my own opinions which I won’t attempt to hide: when someone in Britain, perhaps of Indian descent, gives me a shrug for colonialism and says at least India got railways out of it, I reply that China also has good railways. It doesn’t help, perhaps because the people I am talking to no longer have to face being starved to death or racially profiled. Perhaps they also materially benefitted from colonialism, as did many Indians: why would the Tata family object too strongly to the Empire when they grew rich under the Raj? [xvi] So, particular individuals may indeed feel gratitude for being colonised. Yet even among the apologists there is usually some concession to the fact that colonial rule involved brutality, racism and racialised violence, or a recognition that Britain took more than it gave – why else would you bother with an Empire? This from a man who served in the First Anglo-Afghan War. The Fourth Anglo-Afghan war, or Anglo-US-Afghan War, as we might describe the current conflict, reminds us that we could have selfish as well as altruistic reasons for understanding genuine reactions to military occupation. Gratitude and admiration are, I think it fair to say, relatively rare reactions to occupation, yet still we expect them. Perhaps, the argument might be made, a real Sita Ram wrote the manuscript with the patronage of Norgate in mind, with the eye of the officer upon his pen. No slip-up could be made, no hint of sedition or admission of guilt, no doubts about the rights of the white man could enter in. But couldn’t we say such a manuscript was also written by Norgate, at least in part? The sword is mightier than the pen, particularly if the sword is held by a white man and the pen by a colonised black man. Or to put it another way, propaganda is not produced only by one man, where the necessary violence of colonialism can most surely be held at bay by pleasing the masters. The notion that we in the present day might, by lack of attention, allow that violence to perpetuate itself through unchallenged online citation is disturbing – or I feel it should disturb us. We can never, it must perhaps be admitted, be entirely sure who wrote From Sepoy to Subedar. Its origins are now lost in time. Yet this raises a question of what we are to do when faced with a lack of information, and whether we are to allow the lack of information to perpetuate itself in an internet culture that produces and reproduces so much information that it can never all be challenged by rigorous academic investigation. Doesn’t it sometimes fall to relatively amateur investigators such as myself to point out that a source is not reliable, should be bracketed and treated with suspicion until we know more? And shouldn’t we try to make more space online for informed amateurism, beyond the discussion pages of Wikipedia? I will conclude then by stating my position on From Sepoy to Subedar as clearly as possible. It seems to me that shrugging our shoulders and saying we don’t know is not good enough in the face of the question marks over From Sepoy to Subedar. Rather, a certain amount of scientific scepticism is in order. It is not, I would suggest, the duty of this writer or anyone else to prove that Sita Ram is a fiction, because no proof has ever been offered of his existence. It is incumbent upon those who believe him to be a real historical sepoy-author to prove their position. This is the approach that should have been taken in 1873 and was not. This is the approach that should be taken now every time the book is cited, either online or in print. If in 1873 it was difficult to challenge the practice of colonisers putting words into the mouths of the colonised, the blogger or Wikipedia writer of 2014 has the political space to mount that challenge, if only they have the time, or someone else has the time to do it for them. Challenging poorly evidenced citations on the internet may seem a Sisyphean task, but with billions of users, millions of challenges are possible. So after all these years, and in an online culture more free of the establishment than previous knowledge cultures, we must finally ask the question: where is the proof that Sita Ram is real, and freely held these views? If no proof is offered, our assumptions should err on the side of doubt, not on the side of credulity. Unless, that is, we still wish to believe certain things about the British Empire that From Sepoy to Subedar is keen to tell us. 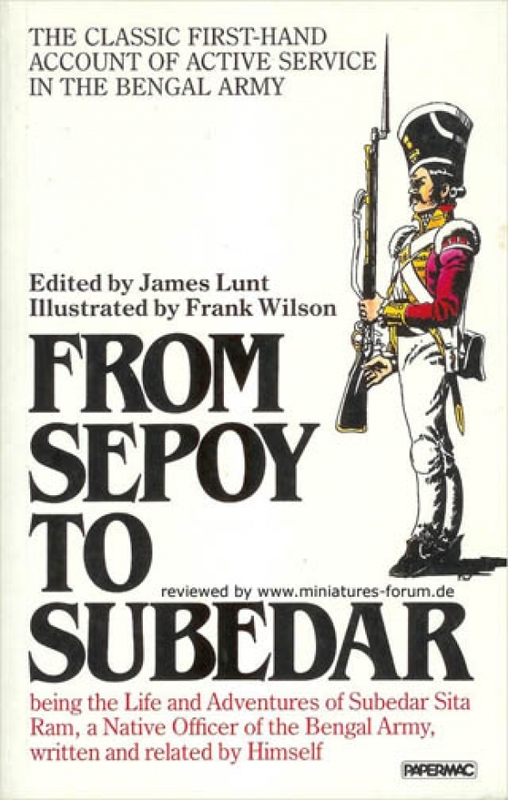 [i] All quotes are from James Lunt’s 1970 edition of From Sepoy to Subedar, as republished by PAPERMAC, 1988. p.174. [viii] Pacific Affairs, Vol XLIV, No. 3, Fall 1971. [ix]From Sepoy to Subedar/Khvab-o-Khayal and Douglas Craven Phillot, Alison Safadi, Annual of Urdu Studies Vol. 25, 2010. [x] See ‘The Habitual Nobility of Being’: British Officers and the social construction of the Bengal Army in the Early Nineteenth Century, Douglas M. Peers, Modern Asian Studies, Vol. 25, 1991. [xv] The Garrison State: The Military, Government, and Society in Colonial Punjab, 1849-1947, Tan Tai Yong, 2005. Previous Post: Living in crisis: should we have the right to a home?